I’m Self-Employed. Can I Fund My Own 401(k)? Retirement plans are common benefits at most large corporations, and generally companies make it easy to contribute. When you enroll, a certain percentage of your salary is automatically deducted from your paycheck each month, before you can even miss it. If you’re lucky, your company will match a portion of your contribution. Things are a bit more complicated when you work for yourself. There’s no automatic deduction from your paycheck. And with other things to worry about, like quarterly taxes and fluctuating monthly income levels, it’s easy for retirement planning to slip your mind. There are 15 million Americans working for themselves these days, according to the Bureau of Labor Statistics. And a recent study found that, on average, the baby boomers among them are about $335,000 short of their retirement savings targets. That could become a crisis as the self-employed reach retirement age. 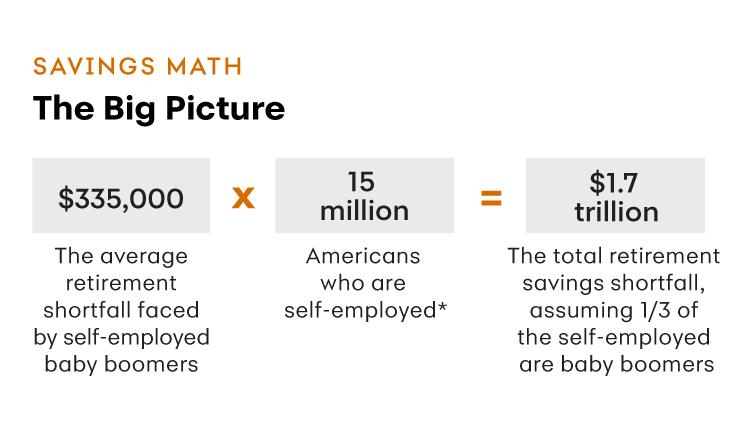 The chart below illustrates how far self-employed people lag in terms of retirement savings. But there is no need to panic, even if you are a self-employed boomer. Just get yourself educated and start saving. There are a number of options available beyond the traditional 401(k) plan, says Dan Andrews, founder of Well-Rounded Success, a personal finance consulting firm based in Fort Collins, Colo. He advises the self-employed worker to start by opening an Individual Retirement Account (IRA), a savings vehicle that gives a tax break for investing money for retirement. Andrews suggests that in addition to contributing to a traditional IRA, you should also max out your Roth IRA, which allows after-tax income contributions. One upside to a Roth IRA is that you won’t have to pay taxes when you take it out—and there’s no forced withdrawal at a certain age. You can contribute up to $5,500 to a Roth IRA (or $6,500 if you’re 50 or older) if you are single or the single head of a household, and your modified adjusted gross income is less than $120,000 for 2018. Individual 401(k) plans. These work much like traditional 401(k)s, but they’re designed for self-employed people without any employees. In addition to their tax advantages, they offer elective deferrals of up to 100% of compensation, with an annual contribution limit of $18,500 in 2018, or $24,500 if you’re over 50. There are traditional and Roth versions of these plans—and you’re allowed to split your contributions between the two types. You can also borrow against your savings, something that many other plans don’t allow. SEP IRAs. A SEP (simplified employee pension) lets any self-employed person, whether solo or with employees, contribute to a traditional IRA, meaning the money isn’t taxable until it is withdrawn. Maximum contributions for a SEP are higher than for traditional IRAs, making them good catch-up plans. You can contribute up to 25% of your compensation, or $55,000 for 2018. Chris Morris regularly contributes to national outlets including Fortune, CNBC.com, Voice of America, Variety and Common Sense Media, as well as dozens of other major publications.